The barometer has engraved pewter register plates. It is signed in a seemingly hanging cartouche, embellished by a bow with swag on the left-hand register plate in the following manner: Barometer Contraleur en Thermemeter D: Tachi ZZee. It has a Torricelli tube in the middle, with scales in Imperial inches with the corresponding weather conditions to the left. 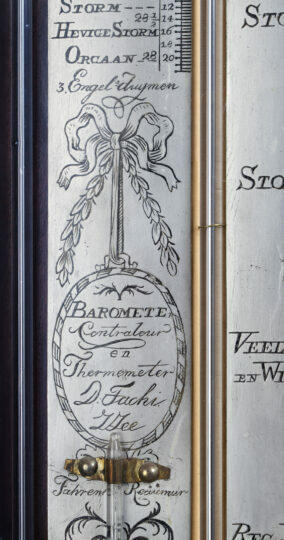 The right-hand register plate has a full-length scale in Imperial inches on the right, also with the corresponding weather conditions, for the Huygens tube: the tube filled with liquid, which is visible to the right. The use of a Huygens tube allows a much larger scale so that the reading can be much more accurate. To facilitate accurate reading and comparison with the previous reading, there is a brass setting hand, which can be operated to the side. 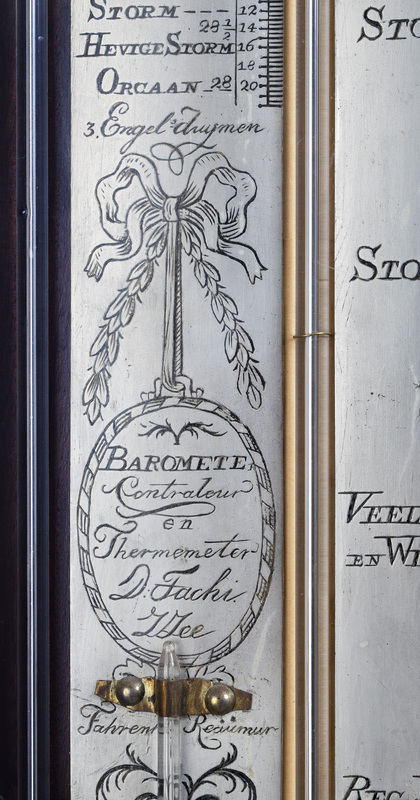 On the left-hand register plate below the signature is an alcohol thermometer with scales in Fahrenheit and Réaumur. The register plates have medallions with engraved heads at the top and are embellished at the bottom with a bunch of leaves and an engraved flower. The mahogany veneered oak case has a reservoir cover at the bottom. The register plates and tubes are protected by a mahogany-framed glazed door. The chamfered architectural top above a frieze is embellished with mouldings. The cover is surmounted by three turned tube protectors, whilst the bottom has two turned drop finials. 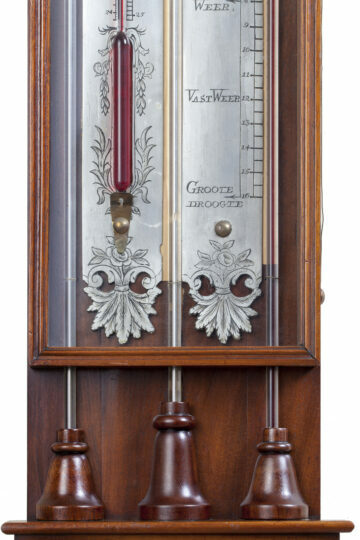 D. Tachi could be Francis Tachi’s son, a barometer maker, born in Italy in 1771 who initially worked in Middelburg but later, around 1810, moved to Zierikzee. It is known he had a son and it is likely that this was D. Tachi, about whom little is known in the literature. – Bert Bolle, Barometers in beeld, Lochem, 1983, p. 248, note 445.